MEMPHIS, Tenn. -- He's America's best known and most loved TV fisherman, recognized the world over; the Southern gentleman angler who sports the “T” for his favorite university and the state of Tennessee. 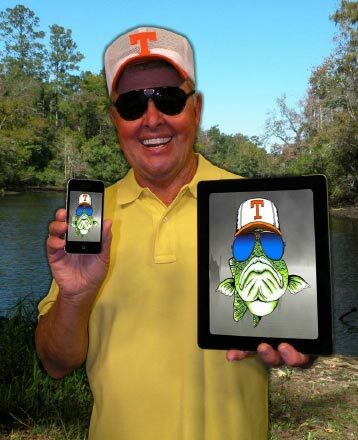 Now Bill Dance has “gone viral” producing his own free iPhone, iPad and Android application full of fishing tips that's made him successful over his four decades of pro BASS tournament fishing and in the filming of his popular weekly national TV show Bill Dance Outdoors. "There was a time when I thought that nothing could give me more pleasure than locating and catching bass. But there is something far more rewarding to me---and that‟s being able to share what I've learned about this elusive game-fish," he said, smiling. "My TV series affords me this opportunity to a degree, but there never seems to be time for me to pass on to my viewers everything I'd really like to share. The volume of questions and requests I get in the mail or email substantiates this fact. In view of this I've spent the greater portion of the past year putting together this new 'Bill Dance App,' and I hope that anglers worldwide enjoy learning from my experiences on the water, as much as I've enjoyed bringing this information to them. of the toughest fish to catch. We used detailed graphics, some in 3-D of the structural features. We take the viewer through the whole technique. “It's probably the most complex app in fishing. And the tips I like aren't the everyday tips. They're easy-to-understand seasonal tips like how to read water, structural tips, technique, lures, and presentation of different types of baits in different seasons. We cover the anatomy of the fish, their habits in moving water, important tips about habitat, how fish react in clear to muddy water, in highland, lowland and midland reservoirs, natural lakes and ponds, plus how to balance your equipment, the wide variety of fishing lines and knots, how to pack a tackle box, and everything from the top to bottom.